Operational visibility and risk management are key considerations for any business with multiple operational units. The reporting in Intercompany integration solution for SAP Business One allows users to view the real-time information, enabling accurate analysis of the financial data from one or all branch companies. The user can export the intercompany report to Microsoft excel, copy/paste to Microsoft word or print as a PDF document. 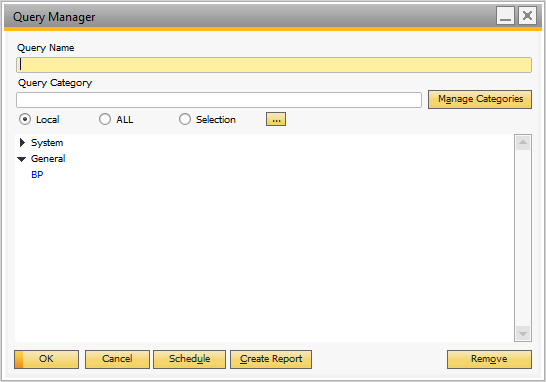 Intercompany solution provides standard reports in the system and allows user to create additional reports using query wizard in SAP Business One. Branch companies can use this report to determine the real-time stock position of items across the organization. The application lists current inventory of all items in each subsidiary, including foreign subsidiaries providing in-stock, committed, ordered, and available quantities. Summary View: The summary view sums up stock information for each item across all branch companies. Detail View: The detail view displays stock information for each item in each company. 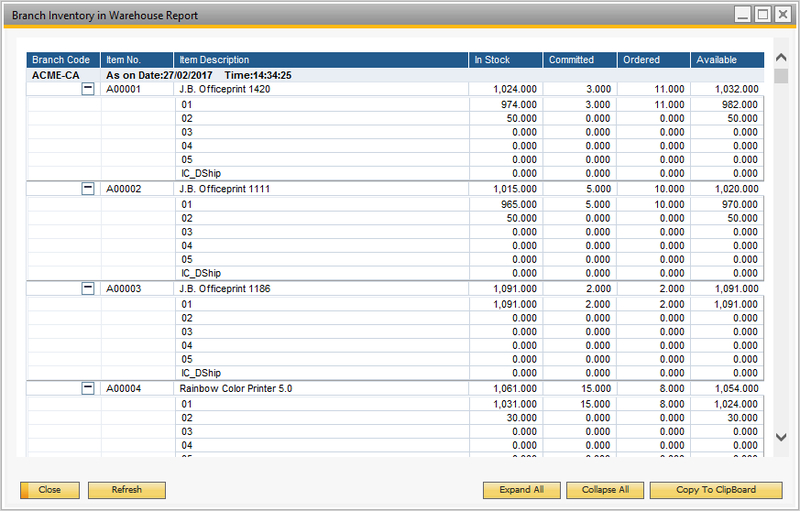 In the SAP Business One Main Menu, choose Inventory->Inventory Reports -> Branch Inventory in Warehouse Report. Specify the selection criteria and choose OK. Branch Code: Select the companies whose stock information should be displayed. Leave this filter blank to display stock information from all companies. Code: Select the items whose stock information should be displayed. Leave this filter blank to display stock information for all items. 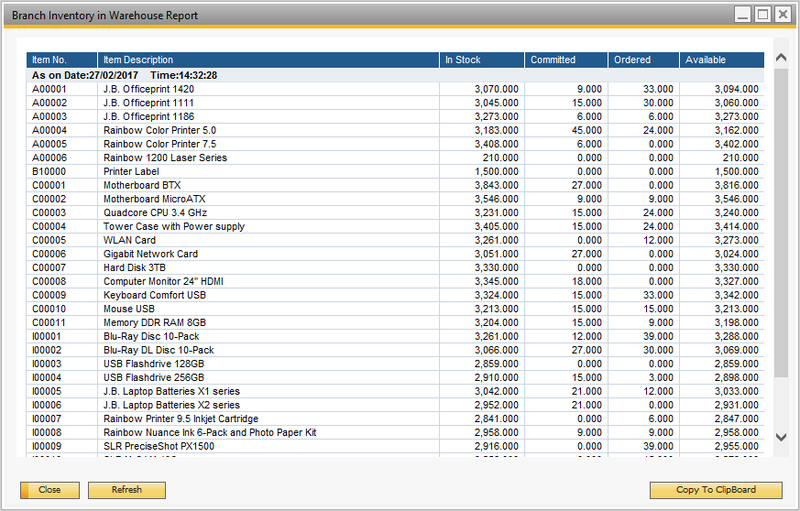 The Branch Inventory in Warehouse Report window is displayed. To display the stock position data, choose Refresh. Branch Companies can use this report to determine the real-time sales data across the organization. With this report, user can view the consolidated sales for each operating entity in a single report, to know how products are selling across various regions. Sales Analysis by Customer: This view displays the sales volume for each customer across branch companies. Sales Analysis by Item: This view displays the sales volume per item across branch companies. 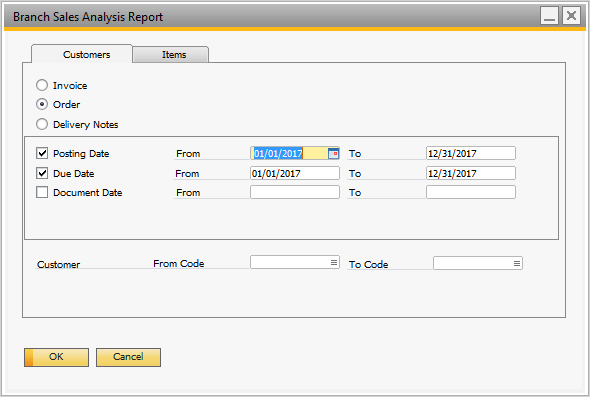 In the SAP Business One Main Menu, choose Sales A/R -> Sales Reports -> Branch Sales Analysis Report. Invoice, Order, Delivery Notes: Select the document type on which you want to base the sales analysis. Posting Date From … To…: Specify a date range. 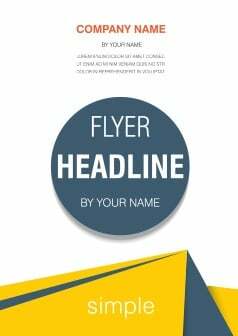 All transactions with a posting date within the defined range are included in the report. Due Date From … To…: Specify a date range. All transactions with a due date within the defined range are included in the report. Document Date From … To…: Enter a range of document dates for the chosen transactions to be displayed in the report. Customer: Specify the range of customer to include in the report. Items: Specify the range of Items to include in the report. The Branch Sales Analysis report is displayed. To display the sales data, choose Refresh. The report provides an organization wide single view of all payables and receivables from trade between the business units and subsidiaries. Local View: This view displays the receivable and payable data from the current company. Global View: This view displays the consolidated receivable and payable data from all branch companies. Branch Balances: Select whether only data from the current company should be displayed (Local) or data from all branch companies should be consolidated and displayed (Global). 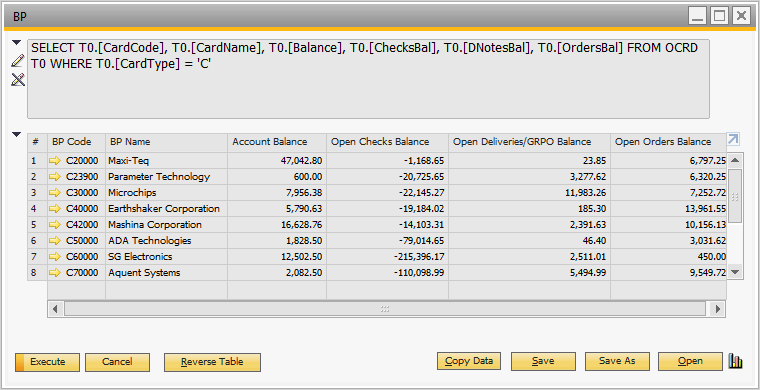 The Branch Balances Report window is displayed. This report displays the real-time consolidated account balances of the global business partners across branch companies. Detail View: The detail view displays balances for each business partner in each company. 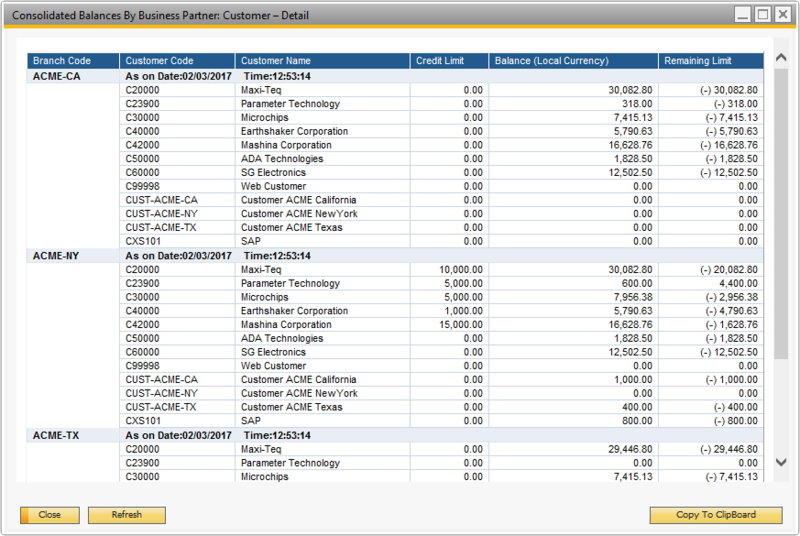 In the SAP Business One Main Menu, choose Business Partners -> Business Partner Reports -> Consolidated Balances by Business Partner. 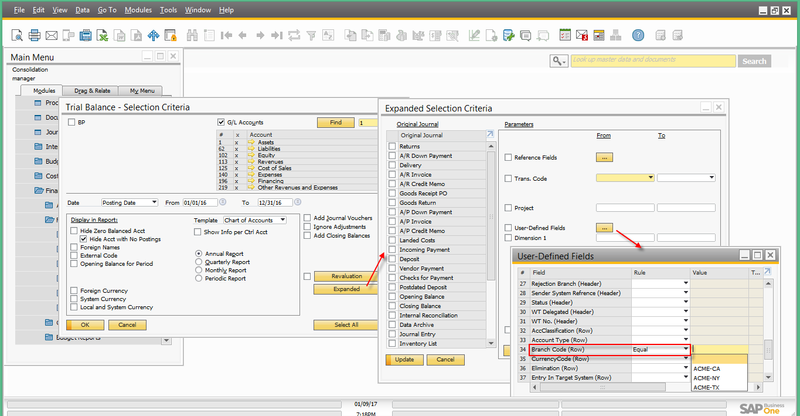 Type: Select the business partner type (Customer or Vendor) whose balances should be displayed. Code: Select the business partner codes whose balances should be displayed. Leave this filter blank to display balances for all business partners. View: Select how the balances should be displayed. The summary view sums up balances for each business partner across all branch companies. The detail view displays balances for each business partner in each company. 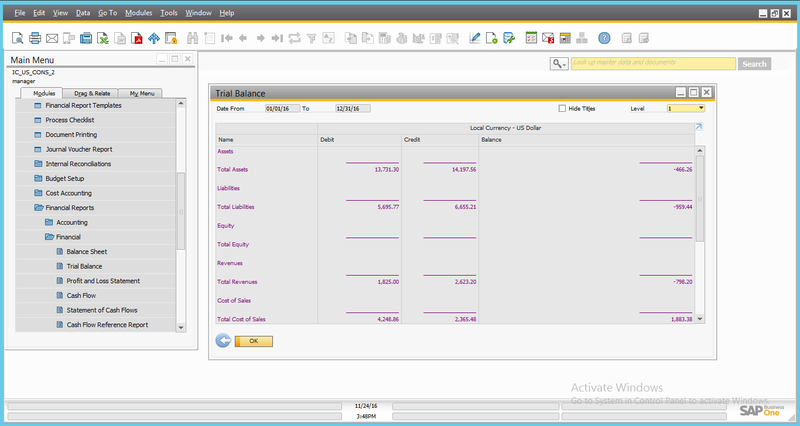 The Consolidated Balances by Business Partner window is displayed. 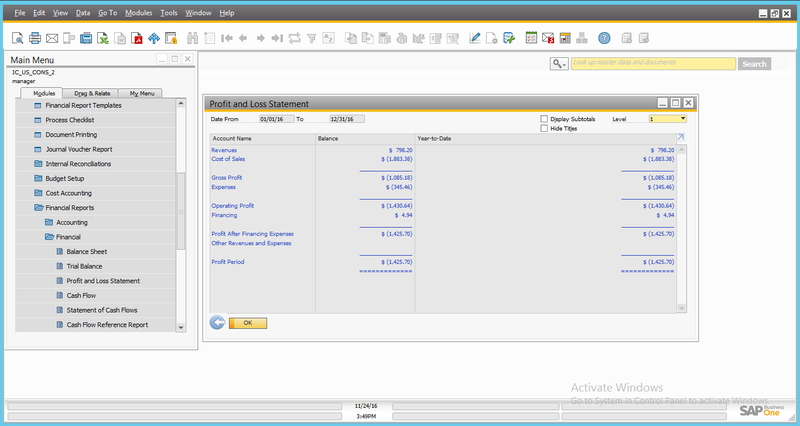 To display the business partner balances data, choose Refresh. This report lists all incoming intercompany documents that are not yet accepted and posted by the receiving subsidiary. Journal Vouchers created as a result of G/L Allocations. 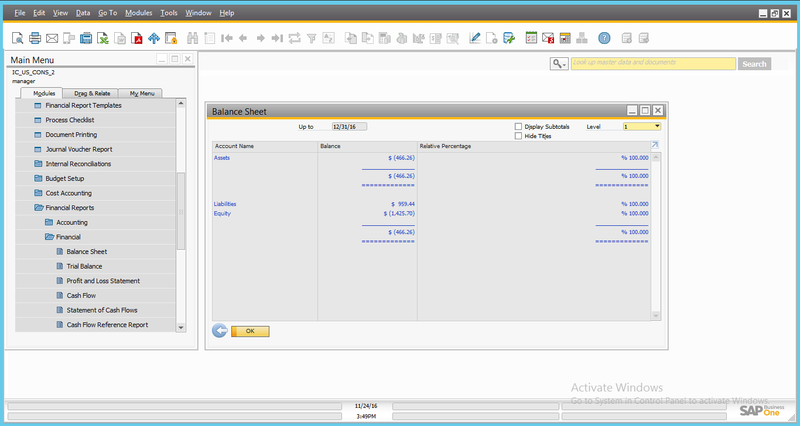 From the SAP Business One Main Menu, choose Financials -> Financial Reports -> Un-posted Intercompany Transactions. 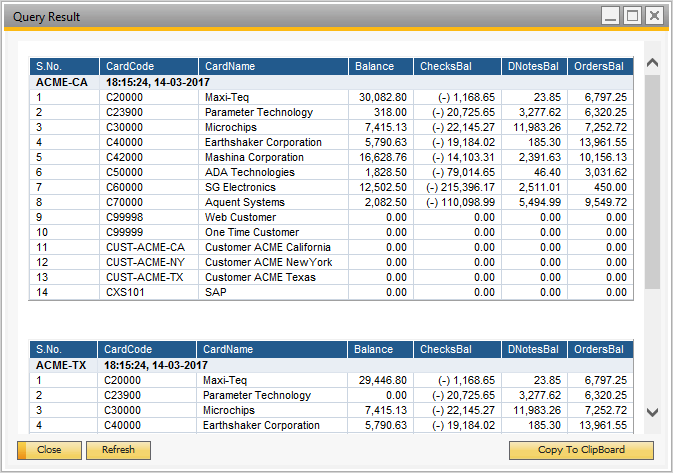 Code: Select the companies whose transactions should be displayed. Leave this filter blank to display transactions from all companies. The Un-posted Intercompany Transactions window is displayed. To display the data, choose Refresh. Remote Query Execution: Enables to execute the same queries across partner companies to generate ad-hoc reports in real-time by extracting the most updated data from the partner companies. 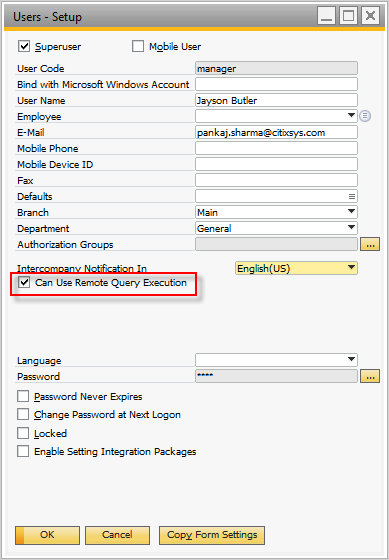 Note: If Can Use Remote Query Execution checkbox is selected in the Users – setup window then only Remote query execution feature is available for the user. Create a query using the Query Generator or Query Wizard and save it. Open the Query Manager from Tools -> Queries -> Query Manager. Select the query created in step 1, or a standard SAP Business One query from the System category.Note: To use the Remote Query Execution feature, you must save the system queries with a new name. Ensure that the field alias does not contain spaces or any special characters. 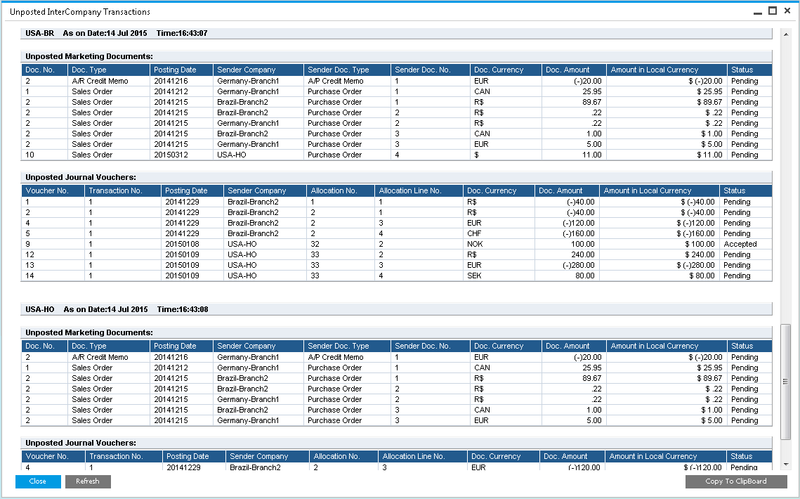 Local: runs the query on the local company as per standard SAP Business One functionality. Selection: Selecting this will open a new window that contains the list of branch companies. You can select the branch codes in which the query needs to be run. 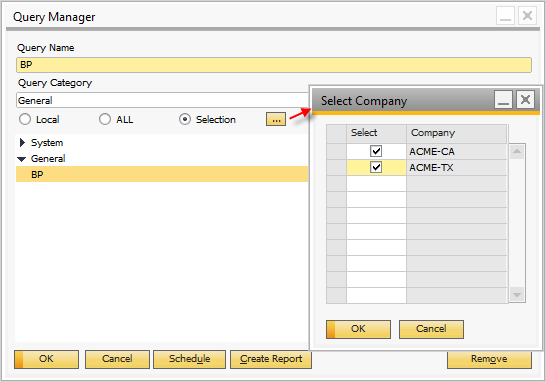 Select one of the options from the Local, ALL, Selection options and choose Ok.If Local mode was selected, the standard SAP Business One results window is displayed as shown below. Otherwise, the Remote Query Execution window is displayed. The Consolidation feature of intercompany solution allows the journal entries of all branch companies to be consolidated into a consolidation company, enabling a single, easy way of running SAP Business One financial reports for the entire organization. All consolidated financial reports are viewed within SAP Business One, and in SAP Business One standard formats. After executing the financial consolidation process in the consolidation company, the user is able to generate the following consolidated financial statements. Choose Update in the expanded selection criteria window and Choose Ok. The data appears will be filtered based on the selected branch code (group code). Similarly, you can filter other consolidated financial reports.